Thisilyn is a proprietary standardized milk thistle extract produced by the company Nature’s Way. It is design to support detoxification and healthy liver function. Thisilyn is used generally for liver health and as an antioxidant to protect the body from free radical damage. This compound is said to provide anti-aging benefits, prevent liver damage caused by environmental toxins and to support the immune system. Compared to standard milk thistle extract supplements, this proprietary formulation is purported to be 2x better absorbed by the body, requiring a smaller dosage to achieve beneficial effects. This branded ingredient is available on its own or in other Nature’s Way products, such as Super Thisilyn or Thisylin Cleanse. It is standardized to contain 80% silymarin, the active bioflavonoid compound in milk thistle. 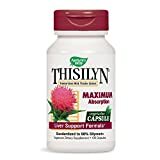 The standard Nature’s Way Thisilyn supplement contains 175 mg of German milk thistle seed extract per dose, yielding 140 mg of silymarin in a single serving. Milk thistle (Silybum marianum) has been used for over 2,000 years as an herbal remedy for liver, kidney and gallbladder disorders. Today it is known to contain a unique group of flavonoids that are collectively referred to as silymarin. Silymarin is composed of silibinin, silidianin and silicristin. It exhibits antioxidant, anti-inflammatory and hepatoprotective properties. Studies indicate that silymarin can help repair damaged liver cells and help protect healthy liver cells from damage. Thisilyn is marketed as a product used to support a healthy liver. According to the manufacturers, this proprietary brand of silymarin is more bio-available and better absorbed in the gastrointestinal tract. Milk thistle, silymarin and Thisilyn are used for disorders related to the liver, including toxic liver damage (caused by chemicals, alcohol or chemotherapy), cirrhosis, jaundice and chronic hepatitis. They are also used for indigestion (dyspepsia), diabetes, gallbladder disorders, menopausal symptoms and infertility. Milk thistle and silymarin are used for a wide array of health indications because they exhibit antioxidant and anti-inflammatory properties; the above list is only a sample of their current uses. Thisilyn is standardized to provide 80% silymarin extract per dosage. Silymarin is considered the bioactive constituent of milk thistle. As noted, it is composed of three flavonoids (silibinin, silidianin and silicristin) that collectively exhibit antioxidant and anti-inflammatory properties. Silymarin is concentrated in the seeds of the milk thistle plant, which contain between 4 and 6 % of the flavonoid complex. Thus, standardized products like Thisilyn provide significantly higher levels of silymarin than milk thistle supplements. The liver is responsible for neutralizing toxins from the blood, secreting bile and performing other functions related to digestion, hormone regulation and the immune system. Milk thistle has been used in traditional medicine practices throughout Europe for thousands of years. It is native to the Mediterranean but is now naturalized throughout Europe as well as parts of North America and Australia. The plant can be identified by its purple flower and white veins, which were sometimes claimed to carry the milk to the Virgin Mary. Its Latin name is a reference to this history, with Silybum identifying all thistles and marianum referring to the Mary thistle or milk thistle. Traditionally, milk thistle is used for depression (depression or melancholia was historically associated with the liver), liver ailments and to treat poisonous snake bites and encourage milk production or lactation. One of the first recorded uses of milk thistle dates back to Ancient Greece when it was given to patients who had been bitten by poisonous snakes. Traditionally, milk thistle flower heads were boiled and eaten like artichokes as a spring tonic. The seeds of the milk thistle plant were also used to make decoctions or tinctures. Contemporary research reveals that silymarin is concentrated in the seeds of the plant. Thisilyn, milk thistle and silymarin are being investigated for a number of therapeutic uses. According to Nature’s Way, adults are advised to take three 175 mg capsules of Thisilyn per day. Each 175 mg capsule contains 140 mg of pure silymarin extract. The other ingredients in Thisilyn are cellulose, potassium bicarbonate, magnesium stearate and the ingredients used to make the capsule shell, which is derived from plant sources. User reviews on Amazon.com are generally positive. Individuals report improved liver enzyme tests and reduced alcohol hangovers with Thisilyn. Thisilyn and other milk thistle extracts may interact with a number of prescription and over-the-counter medications. It is best to speak with your doctor before you take milk thistle or Thisilyn to make sure that you are not at risk of adverse reactions or drug interactions. Silymarin is known to affect the cytochrome p450 enzyme system of the liver, which is involved in the metabolism of some medications. As a result, it may affect the way that certain medications are are broken down by the liver, and may increase or decrease the strength and/or side effects of these medications. Milk thistle extracts like Thisilyn are classified as galactogogues or substances that increase lactation. Pregnant and/or nursing women should get their doctor’s permission before supplementing with Thisilyn. Insufficient clinical evidence exists to understand the full effects of Thisilyn on developing babies and newborns. Silymarin may affect blood glucose levels and may interact with prescription and non-prescription medications the exhibit the same effect. In all cases, be sure to speak with your doctor before taking Thisilyn to make sure it is safe for your unique needs. Milk Thistle: Professional Monograph. Natural Medicines Therapeutic Research. Reviewed 20 Jun 2012. Updated 12 Jan 2016. Accessed 25 Jan 2016. Abenavoli L. Non-alcoholic fatty liver disease and beneficial effects of dietary supplements. World J Hepatol. 2015 Jun 28;7(12):1723-4.